Mercury HMI Ltd are pleased to announce that Extech Safety Systems are now the sole agent for Sub-Saharan Africa. The Mercury 2+ Terminal has now been tested to IP66 rating. This was performed by Dunlop Testing Services. Our Mercury 2+ keyboard has been re-designed to provide longer life and better tactile feedback. 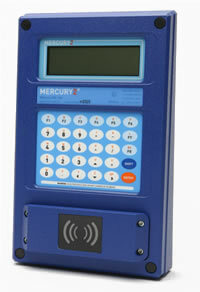 The Mercury 2+ Terminal is a robust Zone 0 operator interface with optional integral security card reader. Mercury HMI is a UK based company specialising in the design and manufacture of hazardous area products for the petrochemical and pharmaceutical industries. Our product range includes operator terminals, card readers, pulse transmitters, signal conditioning and other associated equipment for use in potentially explosive atmospheres. Operator terminals and card readers are commonly used for access control and data entry on road tanker loading gantries, LPG bottling installations, and other similar applications.